The dmXLAN 1S is a desk or surface mounted Ethernet to DMX or DMX to Ethernet node with a choice of either male of female XLR panel socket. The dmXLAN Node 6X combines a 6-port DMX to Ethernet node with a 5-port Ethernet switch in a single 1U high unit. DMX to Ethernet/Ethernet to DMX node with 8 fully programmable DMX ports and a dual port Gigabit switch. 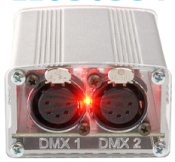 DMX to Ethernet/Ethernet to DMX node with 8 fully programmable DMX ports. The showSTORE XLan is an advanced DMX controller that can record and playback DMX data like a tape recorder. The DT2210 is a 19” rackmount DMX splitter supporting the bidirectional extension to the DMX protocol to accommodate Remote Device Management (RDM). The DT229 is a 19” rackmount DMX splitter supporting the bidirectional extension to the DMX protocol to accommodate Remote Device Management (RDM). 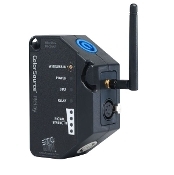 The dmXLAN switch 5 has been designed specifically for the high data rates and reliability required for live entertainment technology applications. SHoW DMX SHow Baby plug and play wireless DMX and RDM transmission. Perfect for venues where a full DMX system might be too expensive.